Although glasses were not always thought of as "cool" in the past, there are many styles and big name brands to choose from these days that are actually quite stylish. Many people have come to use them as another trendy accessory to go along with their shoes, scarves, purses, and more. Some choose to have more than one pair, so they can have the proper frames for different outfits. Whether metal or plastic, you can find a pair that will complement your face. 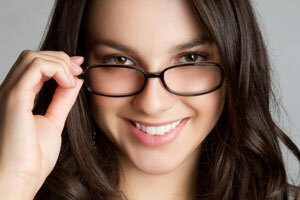 For those who prefer a barely there, less noticeable style of glasses, there is always the option of rimless glasses.